Some time ago I tried the 3-ingredient biscuits that Duke’s mayonnaise features on their website. It couldn’t have been easier to make those biscuits, and they ended up being very flavorful, moist and delicious. 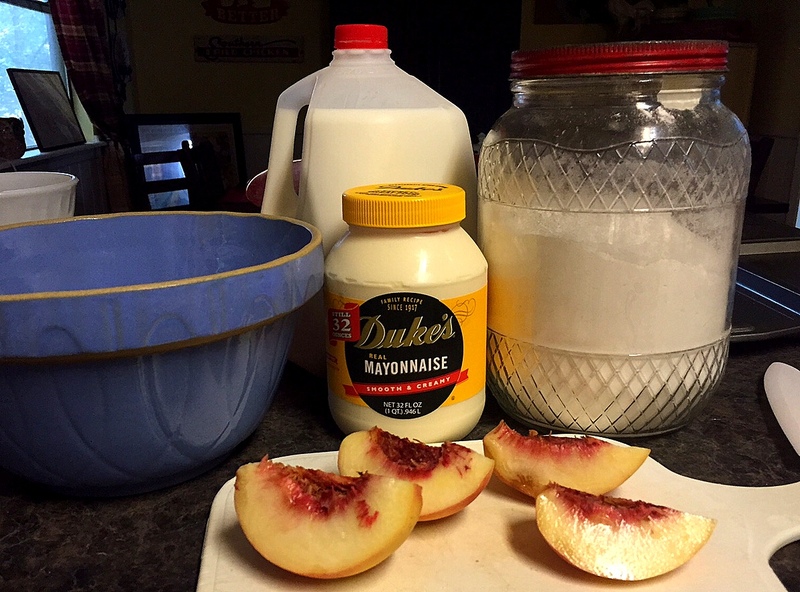 I make them frequently now when we have family gatherings….something Duke’s mayonnaise has always been a part of in my family, anyway. This morning as I was wandering sleepily through my kitchen on the way to my pantry, I saw a big, beautiful white peach on the island, getting a bit too soft for eating out-of-hand. I almost tossed it, but then inspiration hit me: why not bake it into breakfast biscuits with some cinnamon and maybe a touch of brown sugar? What could possibly be wrong about that? They turned out wonderfully delicious, in fact. Cooking intensifies the flavor of even not-so-great peaches, and the cinnamon brings its warm flavor and color to the mix, making this a really good recipe for breakfast or brunch. As fall and winter approach, this recipe becomes even more on target! I hope you’ll give it a try. 2. In a medium mixing bowl, combine milk and mayonnaise. Stir until completely combined and smooth. 3. Add the flour. Stir until just incorporated. Dough will look somewhat wet. 4. Add the chopped sugared-and-spiced peaches to the dough and fold in with a spatula, being careful not to overwork. Just make sure the chunks of peach are fairly well distributed throughout the dough. Use a large serving spoon or cookie scoop to form biscuits, dropping scoops onto a lightly-sprayed or greased cookie sheet. Bake for 12-14 minutes in center of oven. Tops will lightly brown. Made 12 with my generously-sized scoop. I reduced the amount of milk from the original Duke’s recipe for this one, since the peaches contributed their juices to the recipe, which not only moistens the dough, but adds flavor to it as well. Ahh, happy day. Serve my biscuits with softened butter, or add a generous teaspoon of apple butter inside your biscuit, and enjoy every mouthful. Let me know what you think in the comments below! Also, is it ok to disinclude the cinnamon and sprinkle of sugar from the ingredients count if it makes me feel like it’s easier to make these? I like “4 ingredient” cooking and baking. 🙂 What say you?